Sugamo is a neighborhood in Tokyo’s northern Toshima Ward. The area is best known for Jizo-dori , a popular shopping street for the elderly and known as the Harajuku for grandparents. Sugamo Station巣鴨駅・すがもえき (巣鴨: 巣 – nesting 鴨 – duck) is a small station that first opened in 1903. It has 4 platforms, two each for the 山手線やまのてせん・Yamanote Line and 都営三田線とえいみたせん・Toei Mita Subway. It is most famous for the Jizo Dori地蔵通り・じぞうどうり shopping street located on the north side of the station. During the Edo Period江戸時代・えどじだい (1603-1867) the Jizo Dori was a part of the Nakasendo Highway江戸時代・なかせんどう that connected the city of 江戸えど・Edo (present day 東京とうきょう・Tokyo) with the city of 京都きょうと・Kyoto. Today, the 800 meter long shopping street商店街・しょうてんがい is home to more than 200 stores selling 食べ物たべもの・traditional foods, domestic wares, 本ほん・books and 衣類いるい・cloths that are aimed at an elderly audience. The Jizo Dori地蔵通り・じぞうどうり is so popular with older ladies that it has become known as the Grannies Harajukuおばあちゃんの原宿. 巣鴨すがも・Sugamo is also close to Koganji Temple高岩寺・こうがんじ, home to the Togenuki Jizoとげぬき地蔵・とげぬきじぞう and Boddhisattva Kannon洗い観音・あらいかんのん statues. Togenukiとげぬき, “to pull out a thorn,” and it is believed that an illness (the thorn) can be pulled out of the body by placing a charm with an image of the とげぬき地蔵Togenuki Jizo over the injured part of the body (or somewhere on a sick person’s body) and praying over it. It is so popular that long queues of people wait to have such treatment. The Boddhisattva Kannon洗い観音あらいかんのん statue has similar powers. It is believed that if you scrub the part of the Kannon statue that corresponds to your injury, the ailment will be cured. The belief信仰・しんこう in this cure is also strong and draws many people from far and near. The Boddhisattva Kannon also grants quick and painless deaths to those in their old age so that they are not a burden to their families. Have a pesky ailment that’s bugging you? 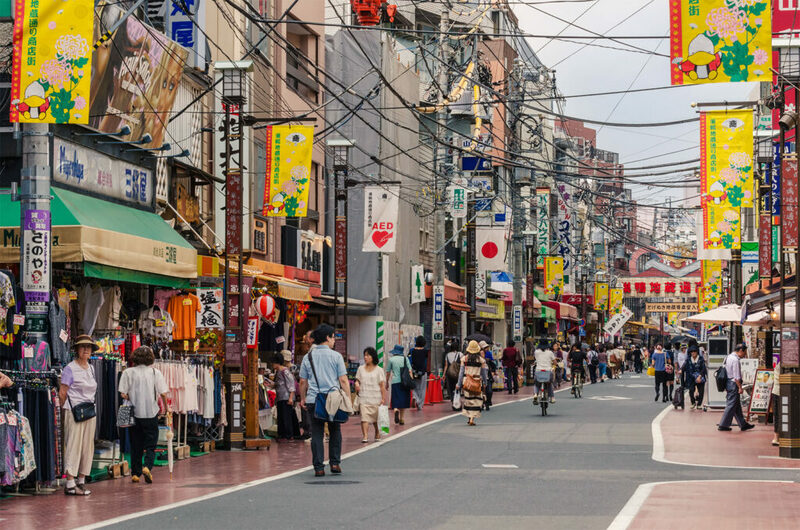 You’ve got nothing to lose and an interesting experience to gain by making a visit to Sugamo.